This Bison leather card case is tanned 100% natural using the same methods that the Native Americans used for thousands of years. Brain tanned Bison leather has its own rich character unlike any other leather. It is thick, yet soft and very durable. Bison leather was used by the Native American's for tipi's, clothing, bags, and horse gear. 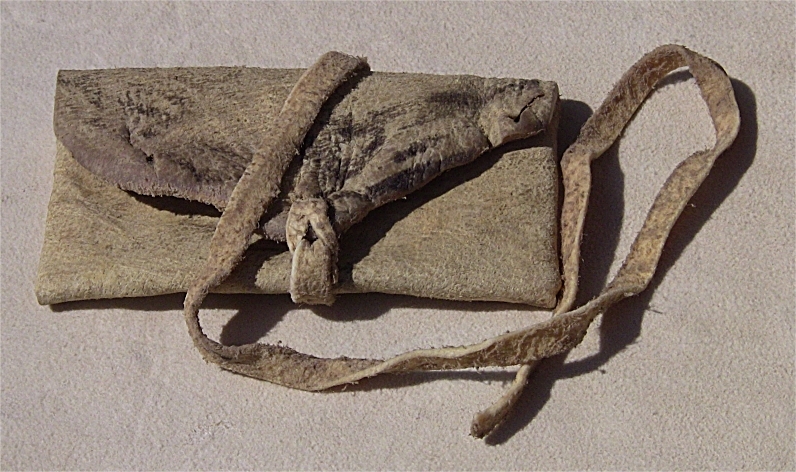 In addition, it is hand stitched with real elk sinew. Brain tanned buffalo is only available today in very limited quantities. The edge of this case retains the shape of the tanning frame and closes with a leather tie. Each piece will vary accordingly. It is large enough for business cards, credit cards, and cash. 4.5" x 2.75".